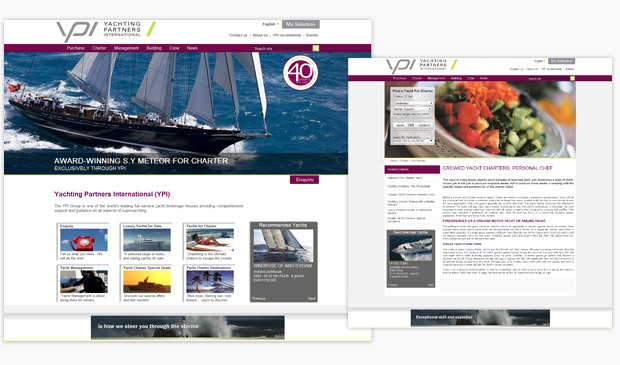 Relevance Web Marketing worked in a team of in-house SEO specialists, developers and designers to create a luxury yachting website for YPI in Monaco. Our SEO Monaco team planned the new yachting website using keyword research and competitor analysis then set about marketing the website online. An SEO site map was created not only to plan the SEO of the site and the assignment of keywords but also to instruct designers and developers what to build. On page SEO and SEO copywriting came next, then our in-house developers migrated old website pages of value to new website pages thus not to lose pagerank. Now the site is live Relevance Web Marketing work monthly on organic positioning, ongoing SEO, link building, news distribution, and social media management. Relevance Web Marketing also broker partnership agreements with other luxury goods companies.